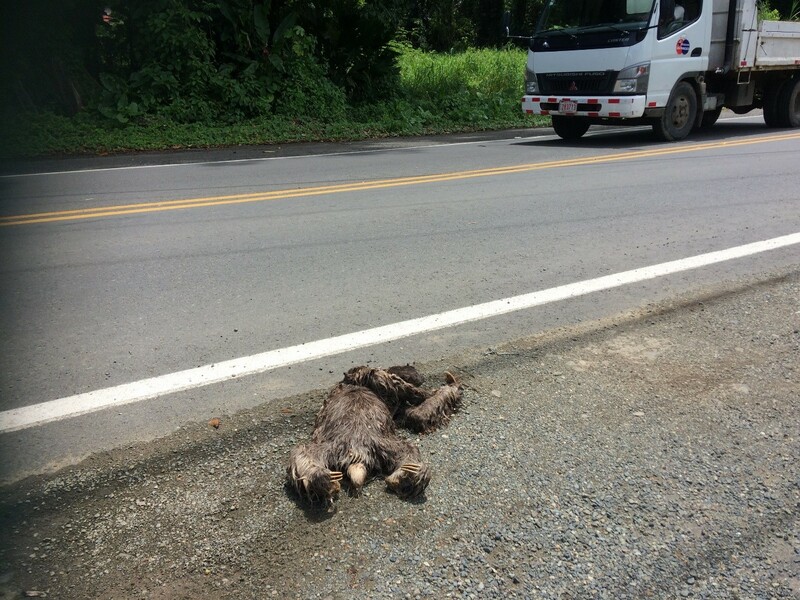 Behind power line electrocutions, the biggest threats to the survival of wild sloths in Costa Rica are dog attacks and road traffic collisions. Both occurrences stem from habitat fragmentation forcing sloths to descend to the floor and crawl across the ground where they are extremely vulnerable. As travel becomes more accessible and increasing numbers of tourists flock to Costa Rica, the infrastructure is being developed to meet the demand. For example, roads that were once pot-hole riddled dirt tracks have been transformed into 80 km/h highways, and the government have just revealed plans to expand the only major highway that links the Caribbean coast to the capital city (route 32), which is now predicted to create a 50-meter gap between the trees on either side of the road. Without a natural or artificial canopy bridge the only way for a sloth to cross a road is by crawling, which takes a lot of time and energy and leaves them very vulnerable to traffic collisions, dog attacks and human disturbance. Sloths maternally inherit highly specific home-ranges and are unable to adapt by moving to a new area when faced with habitat disturbance. Furthermore, their slow movement and limited energy supply means that they are unable to travel along the road to find a place where there is a safe crossing. Sloths will only cross the road in the exact place where they need to cross, and it will be the same place every time for a particular individual. Taking this into account, we have identified the key areas along the South Caribbean coast of Costa Rica where sloths regularly cross the road and are constructing ‘sloth crossing’ canopy bridges to connect the trees on either side. We are working in collaboration with the Monkey Bridge Project on this effort to monitor the usage of the bridges by different species through the installation of camera trap technology.